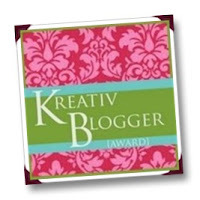 Kreativ Blogger Award - Thank you! After a few weeks of being behind, I'm finally catching up on reading genealogy blogs. I was humbled and honored to find that several of you have nominated my fairly new blog for the Kreativ Blogger Award! Hence, I owe a big THANK YOU to Family Stories, Our Twigs, Herstoryan, Conversations With My Ancestors, Ancestor Soup, and Desperately Seeking Surnames for the nominations! -Link to those sites on your blog. I always forget to start the dishwasher. I put in the dirty dishes, drop in the cleaning tab, close the door and then walk away. My husband finds great humor and frustration in this. I've been to 49 of the 50 States. I only have Alaska left. I am very antsy to cross it off my list, oh, and to see the glaciers and Denali National Park. If I could be anywhere on earth right now I would be having a pint at John Benny's Pub in Dingle, Ireland. I'm on a quest to read 25 books this year. I started in mid-October and am on book number four. Like any good Wisconsin girl, I love cheese. Sliced, diced, on pie, dipped in Western Dressing, any way you can eat it. My husband and I adopted a shih tzu mix named Rackers a little over a year ago. He is named after the Arizona Cardinals kicker Neil Rackers (I let my husband name the dog and I'll name our kids). He is my "furbaby" and I love him, but he follows me everywhere. I am ashamed to admit, but I sometimes try to distract him with treats so that he doesn't follow me. It rarely works. National Parks are my sanctuary. I've been to 24 National Parks (also tons of monuments, recreation areas, etc) so far and would love to visit the rest. My top 5 favorites are as follows: Glacier, Mt. Ranier, Acadia, Zion, and Great Smokey Mountains. Thank you to those who nominated me and I if you are unfamiliar with my nominations, please stop by and pay them a visit. "When you search for ancestors, you find great friends!" Today is Thanksgiving and I wanted to take a few minutes to give my thanks to those who have helped me in my genealogy journey. Without these people, my search would be more difficult and many of my questions, unanswered. Thank you! My Mum: I have spent countless hours pestering you with random genealogy questions and yet, you still answer the phone when I call. Thank you. I know I wouldn't be as far in my research if it weren't for your help. Also, thank you for your multiple visits to random cemeteries to find our relatives. I appreciate your willingness to drag your mother and aunt on these adventures, as it means a lot to them too. My Maternal Grandmother: I enjoy our Friday afternoon chats. I love how they start with the weather and end with stories of your family memories. I will never tire of your stories and appreciate your late-in-life desire to discover your family history. It makes my efforts worthwhile. You are my inspiration. The Museum Curator: You spent months emailing me transcripts of Sylvia's Diary, answering my questions, and forwarding me vital information on Sylvia and the people in her diary. That alone is more than any genealogy can dream of. When I thought I had died and gone to genealogy heaven, you invited me to the museum to see Sylvia's Diary. I was moved beyond words when I saw those little 200 year old handmade books. Then, you let me touch one of the diaries. I cried. I cried of my happiness and Sylvia's struggles. I will never be able to thank you enough. The Twitter Genealogy Crew: All of you are amazing people. You took me under your wings and helped me bring my research online. Now, you support my research, assist when you can, and provide the motivation I need to keep hammering away at my brickwalls. THANK YOU!